In this simple yet rewarding class, you will learn how to make attractive large knots between earthy large-holed gemstone beads. 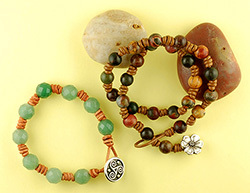 Your knots become accents on your finished bracelet. This easy technique is so much fun you will want to create hundreds of bracelets for your family and friends! This class is suitable for all skill levels.